One dish that happens to be Josh's favorite, and national dish of his homeland, is the Pupusa. It is similar to what a Mexican would call a gordita, it is a thick corn tortilla stuffed with fillings and then seared on a skillet. If you ever find yourself near a restaruant that serves El Salvadorian Pupusas then you must stop in and give them a try. 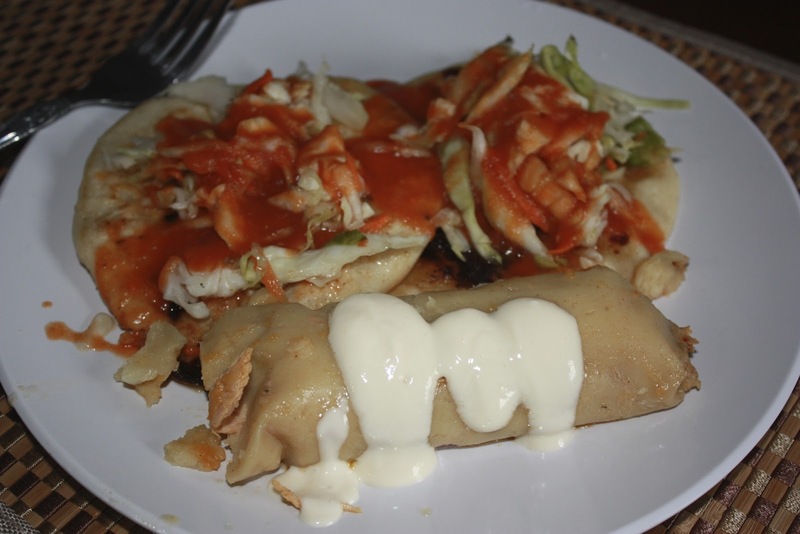 They are delicious, and because they are homemade you know you are eating the best El Salvador has to offer. Josh and I often introduce friends and family to this cuisine, as we have found a few hidden gem restaurants around town that offer a delicious pupusa. The types of fillings we often find are a quesillo cheese pupusa stuffed with a native edible flowering plant known as loroco. It is amazing, and I would describe it as a cross between artichoke and asparagus. The other is a bean and pork mixture they refer to as chicharron. 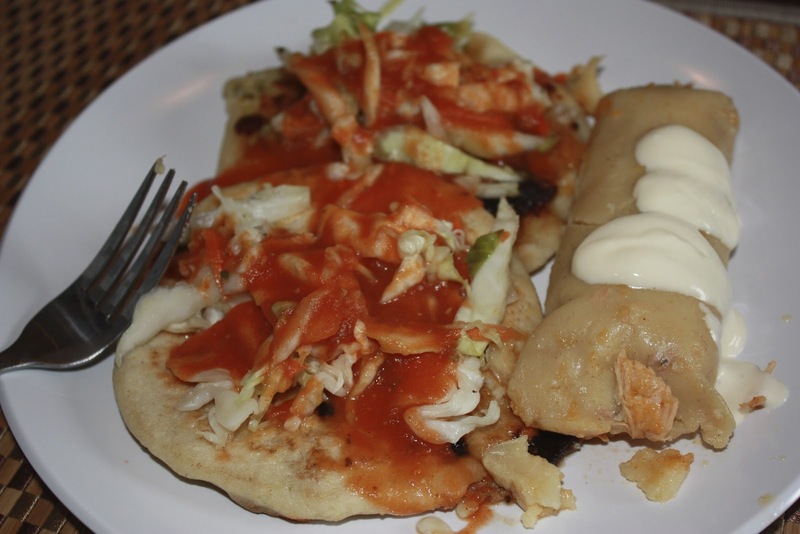 Pupusas are almost always accompanied with two staples, one is a light tomato sauce, and the other is a slightly fermented cabbage and carrot slaw known as Curtido. I've made both from scratch before, they are easy as pie, and the curtido is a super healthy fermented food that aids with digestion and boosts the immune system. The way I've been taught to eat a pupusa is to pile it with both the curtido and the tomato sauce and then eat the whole thing together, it offers a variation of textures, flavors and temperatures that are pleasing and satisfying. Another common dish that we often order to accompany our pupusa is the El Salvadorian Tamale. It is wrapped in a banana leaf rather than a corn husk, which results in the smoothest, softest and most moist tamale you ever dreamed was possible. If I ever make my own tamales from scratch banana leaves are truely the ONLY way to go. I can't describe how amazing it is, you just need to have one for yourself. 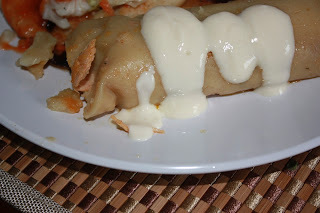 Typically we order two different types of tamales, one is filled with shredded chicken and potatoes, which is my favorite, and they also have a tamale that is slightly sweetened and contains just the corn masa, no interior filling, which is also delicious, but very filling. They are always served with Crema, a latin style sour cream that is richer and tangier than american style sour creams, closer to a Creme Fraiche. I've adopted this sour cream to the only one I keep in my house. Maybe one day I will make this glorious meal from scratch, but I have a hard time believing it would be cost or time effective for me, considering these babies go for under $2 a piece at most restaurants, and are far to convenient to just pick up on the way home... But nonetheless I felt the need to share this delicious meal with you all in hopes that you will try it!